If you don’t have a 2-cup glass measuring cup, you can also use a 32 oz Ball mason jar as the blending vessel. Bonus: You can store your mayo in the same jar! I picked up this jar at a thrift store for $2, but you can order mason jars online as well. Enter: Alton Brown. To get reacquainted with the white stuff, I decided to go with a recipe from the man whom I trusted with all culinary ventures outside my comfort zone. Alton’s party mayo ended up making the most perfect, creamy mayo, first try! Not too runny, not too thick, and super flavorful from the lime juice. My biggest change to his recipe was the use of an immersion blender (aka a “hand blender”) instead of using a food processor in order to make the mayo lickety split and fuss-free. Alton’s recipe was easily adapted to the use of this handy kitchen tool, which whips up mayo in addition to smoothies, salad dressings, and homemade coffee creamer in less than a minute. -This mayo will only turn out well with extra light olive oil. Extra virgin olive oil is the more antioxidant-rich of olive oil, but its strong, peppery flavor is too overpowering for use in mayonnaise. Save your EVOO for salads and sauteeing, where its flavor can shine. -You can use lemon juice for a more classic taste, but I prefer lime for a citrus-laced kick. 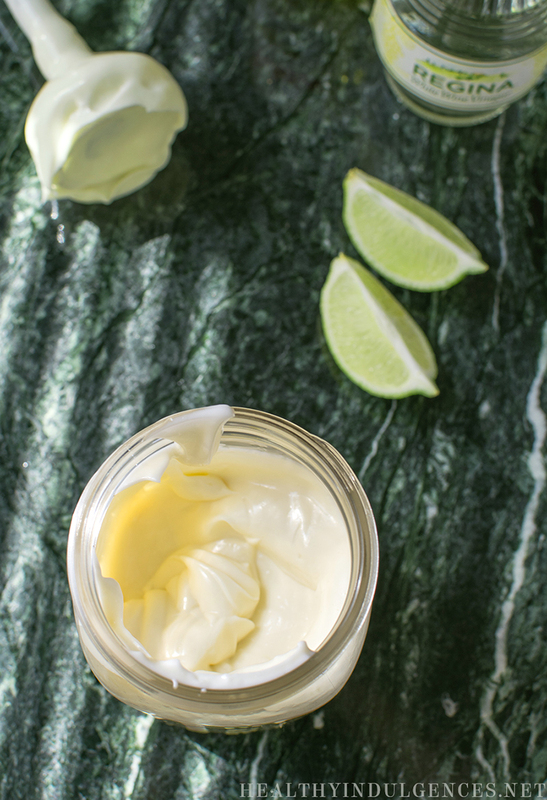 -You can make the mayo nicely tangy by using 2 Tablespoons lemon juice, or cut it back to 4 teaspoons lemon juice for a more traditional flavor. -You must use a narrow container in which to blend the mayo! A 2-cup capacity glass measuring cup is the perfect size, but a mason jar (see photo above) would work well, too. -To make a miracle whip substitute, add more homemade stevia blend or Truvia, to taste. This all natural, soy-free mayo is made with extra light olive oil for a classic taste and good source of healthy fat! Once you see how easily this mayo comes together using an immersion blender, you’ll never want to go back to the store bought kind. I make a batch every week using a wide mouth jar that doubles as the mayo storage container, so there’s minimal clean up. Add dry ingredients to the bottom of 2 cup glass measuring cup. Alternatively, you can use a 12 oz mason jar that is just wide enough to fit the blend nozzle through. Add wet ingredients, pouring oil in last. Lower blending head to the very bottom of the blending cup. Holding the blender head at the bottom, turn on power. Blend till you start to see the white emulsion forming at the bottom of the jar. Move blender head side to side (not lifting up! ), continuing to form emulsion. Slowly, lift the blend up and start pumping it up and down to incorporate more of the oil floating on top. When all oil has been incorporated, stop blending. Transfer mayo to storage container and refrigerate. This mayo keeps for one week in the fridge. « Sugar-Free Broccoli Bacon Salad (Low Carb, Diabetic-Friendly, Gluten-Free) + A New Cookbook! Perfect mayo recipe for me! It’s what I wanted, I a paleo mayo. I’m into the paleo diet so it’s going to be useful for me. Lauren, I followed you years ago and your yummy recipes. I have never ever had luck with homemade mayo UNTIL now! This was perfect. Easy, thick, creamy. Finally. I can’t thank you enough. I hope you are doing well. 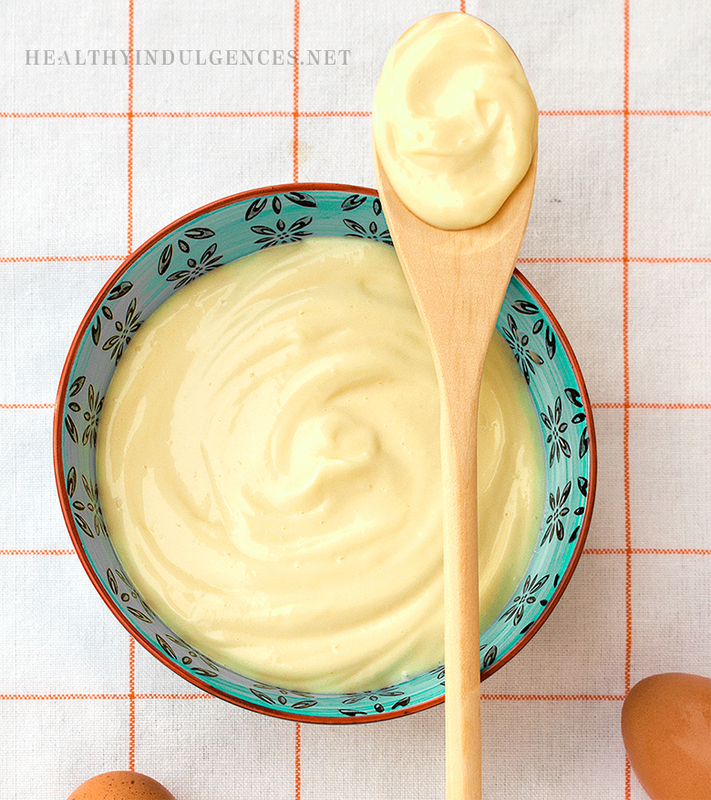 I used to make my own mayo using the same except for lemon juice instead of lime, and 1 packet of splenda as a sweetener, plus would add garlic powder and Cajun Spice. So yummy and flavourful! Great drizzles over salads, veggies, chicken, whatever! This particular Web page supplies data of an common character and is created for educational uses merely. When you have any kind of issues concerning your personal wellness or perhaps the wellness of your respective child, always consult with a medical professional and other doctor. Please assess the Terms of Utilize just before by using this internet site. The use of the internet site signifies your contract to be bound from the Terms of Utilize. Get at wholesale prices. If you would like outrageously low cost walk fit shoe inserts, then your skill is actually look for the web for middleman sites in which promote walk fit shoe inserts in their organization. Ordering in volume will certainly internet an individual 30-50 % lower price based on the volume, naturally. Quadruple the lower price in case you are purchasing the idea from the producer in China. Usually, Chinese suppliers will certainly promote his or her merchandise considerably cheaper if you opt for large quantities. The idea of purchasing walk fit shoe inserts large quantities might be also available but it’s still a choice to get low cost walk fit shoe inserts. Can I use coconut oil instead of light olive oil? I’m going to try the coconut oil tomorrow to see if it comes out ok. I’ll report back here as soon as I make it. it’s a great idea! Please help. When I click on your recipe for natural sweetener blend, it brings me to this mayo page. How do I find the natural sweetener blend? Thank you! How long does a recipe last in the defrigerator?